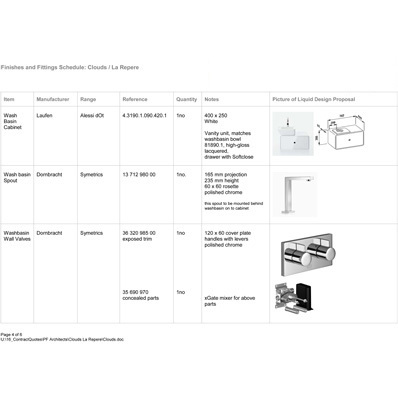 In addition to the production of 2D drawings, as a part of our �design only� service, we produce a sanitaryware schedule listing all the products that you have selected for your bathroom. The sanitaryware schedule will typically contain the item/product description, the manufacturer�s reference and a picture (where available) of all the products that have been selected for your bathroom. This information can then be used to obtain quotes from alternative bathroom equipment suppliers (which will ensure that you receive the most competitive price for the supply of your bathroom equipment). To view an example of one of our sanitaryware schedules please click here.